Storing drill bits and accessories in a place convenient to iny drill press has always been a problem. It's nice to be able to put lbem in a drawer or cabinet below the tool. That way, they're kept clean and organized. Rut if you're using a Door-model drill press, there isn't room to put a drawer. A tray mounted to the drill press is more convenient, but you run the risk of liaving tilings fall off. or of sweeping away drill bits along with the shavings. To solve this problem. I combined the benefits of the enclosed drawer with rhe convenience of a column mounted tray— the result is the shop-made Drill Press Caddy shown above. sandwiched between a top and a base. Using a carriage boll as a pivot ihe trays swing open to provide access. Dust can't gel in. and your accessories are jusl an arm's reach away. size. Hie caddy may look small, but it holds more than yon might think. "Uteres room for a collection of larger bits, like l-'orslner bits. You'll also have plenty of space to store your regular bits along wilh accessories, such as a circle culler or sanding drums. 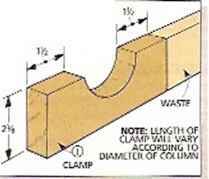 clamp. The caddy is held securely lo the drill press column hv a simple shop-made clamp that starts as part of ihe caddy's oversized top cover. After the damp is ait from ihe cover, ihe two pieces are screwed back together with Ihe column between them. (with or without a caddy) is just one ou j several tools lhal can be useful for a smallM shop. For help in selecting the most appropriate tools for your space and budget, see the Shop I avouf and Storage article on page 4. Tn build the caddy. start by making the two Irays. T1 ie upper tray is shallow, while the bottom tray is deeper. Tne only unusual firing about this is that the front of each tray is slightly thicker than the sides and the back. This provides extra strength for the carriage bolt that passes through the frontsof the trays as a pivot pin. backs and sides. Willi the fronts cut to size. Ihenext step is to make the backs and sides. To keep the trays as light as possible, 1 eut the backs (C. D) and sides (K, !•') from V-" stock (Fig. 1). rabbets. Next, the ends uf the sides (K, 10 have to be rabbeted to accept the fronts and hacks. Ivach of these rabbets are '/»" deep, but since the fronts and bucks are different thicknesses, make sure the widths of the rabbets match these pieces (Fig. 1). groove. With the rabbets complete, cut :/s"-iieep grooves on the inside faces of Ihe fronts, backs, and sides to hold the Vk" hard board button» la). 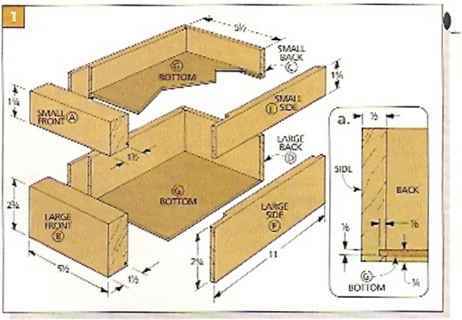 To determine the size of Ihe bottom ((J), dry-assemble a tray. Then measure the inside length arid width and add '/<" to each dimension. Next, cut two but toms to this size and gl«e up the five pieces for each tray (Fig. 1). 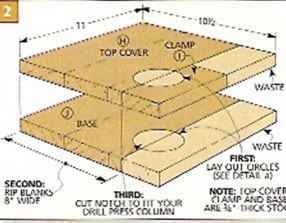 After you've glued up the trays, begin working on the lop cover (H), clamp (I), and base (1). 'Ihe top and ckunp are cut from one wide piece and are used to mount the caddy to the drill press column. Start by edge gluing enough :i/ir-thick stock to form two blanks (Fig. 2). The length of the top cover and base is the same as the length i it"the trays (11"). But to allow the caddy to fit around the drill press column, the top cover and base are cut >t V*" wider ihatt the trays (H)1//) (Fig. 2). notches. A section ol the lop cover becomes the clamp (T) that's used to hold lite caddy to the drill press cohutui. 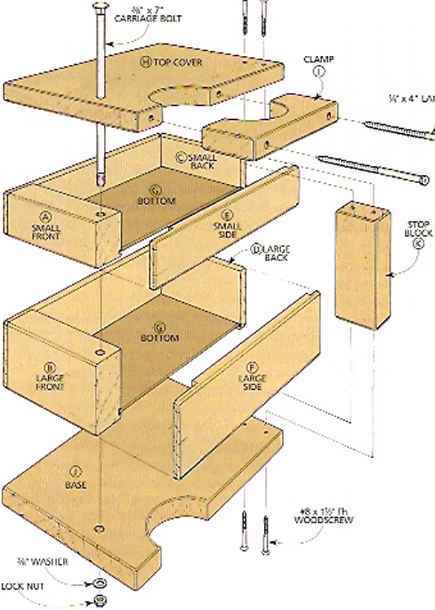 To make this clamp, first lay out a circle on both blanks. 'Ihen rip the lop cover and base through the center of the circle (to a width of A") (Fig. 2a). 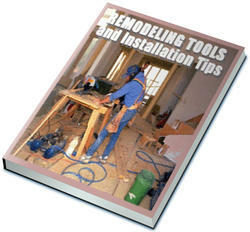 Now cut out the half-circle notches with a jig saw. 'Ihen use a drum ¡Snider to sand up to ihe line. Finally, trim the cut off section of the top cover to form the damp piece (Fig. :<). The only thing left is to drill holes for the lag screws thai attach the clamp to ihe top cover. To make sure that these holes are aligned, lay out the hole loca lions on both the top cover and clamp at the same time (Fig. i). 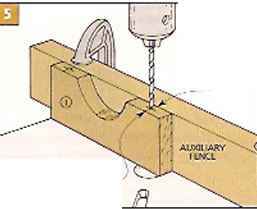 When drilling the holes, an auxiliary fence on the drill press tabic helps sup I¡J port the workpiece. 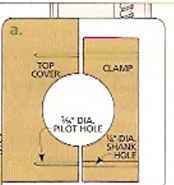 With the fence in place, drill twoshank holes through the clamp (Fig. 5). Tnen, drill two pilot holes in the top cover (Fig. Su). PIVOT HOLES. To make sure all the holes for die carriage boll align for all the pieces. 1 used a simple positioning jig. It's jusl a pair of deals damped to the drill press table (Fig*. 6 and ?). To position ihe deals, first mark the location ol the hole on one of the trays (FUj. 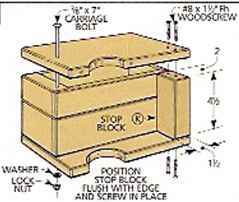 fttJ.Then position a drill bit directly over the mark you just made and temporarily clamp ihe cleats along the front and side of the tray (Fig. 6). 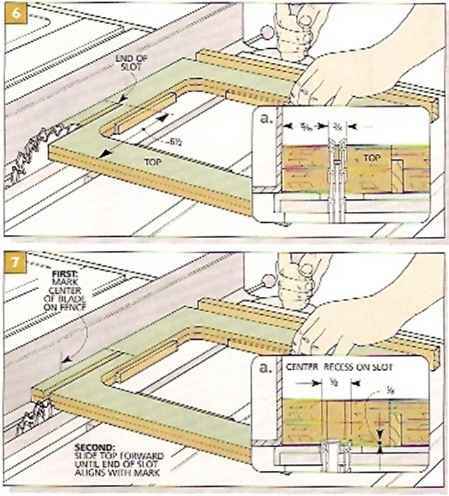 Next, drill a pivot hole in each tray. 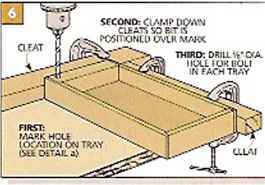 Then without moving the positioning cleats, drill holes through the top cover and die base (Fig. 7). stop block. To help keep the trays aligned when they're closed and to lie the top cover and base together, 1 added a slop block 00. 'Ibis block is cut from 1 '/¿"-thick stock, and ¡Is length is the same as die com bined height of the trays ( t(Fig. >f). •To determine the width of Ihe block, sub tract the width of the trays from the width of the lop cover (in my case, llus was 2"). CHAMFERS. Before assembling the caddy, I e;ised the ifltarp edges by routing V»" chamfers on all Ihe parts. Then I wiped on two coats of tung oil finish to give il some protection. ASSEMBLY. Once the finish is dry, holt die top cover, trays. ;uid base together with a carriage boh and a lock nut (Fig. 3). 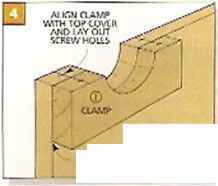 Then position the slop 0") and screw it in place (Fig. X). 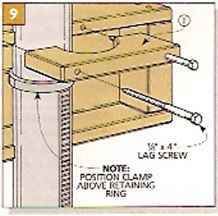 Note: If your drill press has a toothed Kick along ils column for raising and lowering the table, you will need to mount the clamp ulxm- the retaining ring (Fig. 0).